We are currently working on a new Master Plan for Academia San Ignacio de Loyola. The first phase of the Master Plan comprises a new Library and a Cafeteria-Auditorium, currently lacking in the school's infrastructure. The second phase is comprised of new pre-kinder classrooms and imrpovements to the existing infrastructure. 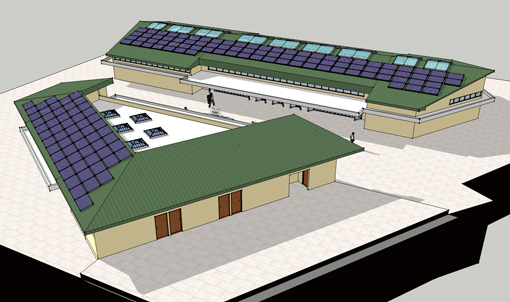 Photovoltaic panels will provide energy for the school's additions, as well as for the existing classrooms and overall facilities. The new library and cafetorium buildings respond to the local site conditions, relating in size and orientation to the existing buildings and the adjacent San Ignacio Church, designed by architect Henry Klumb. Fenestrations are provided to ensure adecuate daylighting as well as views to the adjacent Colegio San Ignacio sports complex. A new "plaza" is created between the two buildings, providing a gathering space that serves as a vestibule for the Auditorium's activities.